My New Year's Wish to You: May you and the children in your lives embrace the New Year with confidence and faith in yourselves and in your dreams. In January, we typically have one eye on the past and one on the future. After acknowledging our accomplishments and shortcomings in the past year, we establish our New Year’s intentions and goals with renewed hope. Many children are wonderfully optimistic and possess a feeling of self-assurance and confidence in themselves, and in their ability to attain their goals. However, other children seem to be born worriers. They may worry about speaking in front of their class, that they are stupid, that no one likes them, etc. etc. Their list of worries can go on and on. Worrying is one of the most disregarded forms of stress. Instead of focusing on what we desire or want, worry focuses on what will happen when things go wrong. Children who worry a lot are great candidates for visualization and imagery. The truth is, worry is negative visualization and it takes a vivid imagination to imagine such horrible scenarios! Gradually, teach your children to focus on their wants and desires, rather than their fears and worries. Tell stories in which your child faces and overcomes a fear or attains his goal. Eventually, he will be able to visualize these positive scenarios on his own. Challenge your child to direct all statements that start with “I am,” towards positive statements and goals. Negative affirmations such as, “I’m just stupid,” or “I’m always sick,” are very harmful because they can penetrate a child’s subconscious, which accepts them—hook, line, and sinker. Our minds and bodies are not separate entities—they are connected. When children create positive pictures and self-suggestion, it can have a beneficial effect on both their physical and emotional health. It sounds simplistic; however, children who picture themselves as happy and healthy will be taking an important step towards becoming happy and healthy throughout their entire lives. Happiness and improved health are gifts that children can give themselves through the power of their own thoughts and imaginations. As parents, we always need to keep in mind that we are our children’s heroes and role models. If we are continuously worried and self-critical, our children are likely to be the same. Worrying projects negative energy and it doesn’t do you or your children a bit of good. In fact, when children are aware that their parents are worried about them it projects a lack of faith and they tend to feel more anxious. Admittedly, there are times when our worries are well founded. Even then, instead of worrying and imagining the worst possible scenario, try to focus on the positive outcome that you desire and on actions that can help to bring it about. Positive thinking is a discipline that can be developed through practice. Let’s help our children to replace anxious, self-critical thoughts and words with a wonderful feeling of self-assurance and absolute faith that their desires and wishes will come true. Foods & supplements that promote sleep. You can learn more about the book and order it via our website by clicking here. Or you can order through Amazon.com by clicking here. Patti Teel is the fairy godmother of peaceful bedtimes. Patti Teel is the creator of a highly acclaimed audio series that teaches children a fail-proof way to relax themselves to sleep through relaxation exercises (based in yoga), visualizations, music & storytelling. And now her new book for parents, The Floppy Sleep Game (to be released on November 1st), picks up where the recordings left off. It contains a step-by-step program for parents to follow and teach their children to relax and/or fall asleep. The techniques from The Floppy Sleep Game book also help children cope with fear and anxiety in a healthy way. You received this message because you previously indicated an interest in receiving Nurturing Children's Spirits. If you received this from a friend or associate and would like to join our mailing list, just click here! 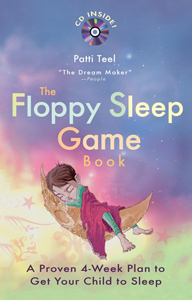 The Floppy Sleep Game Book includes a program which teaches children to relax and fall asleep independently. In the program, visualization is the third and final step. The preceding steps: guided relaxation and attending to the breath, help children to arrive at a relaxed, dreamy state so that they are ready to visualize. Some people think that visualization is ineffective for them if they don’t actually “see” images in their minds. Most children are able to actually see images; however, even if they don’t, the process is still useful. If children (or adults) can remember events that have already happened then they have the ability to visualize, creating something in their imaginations that is not in the here and now. It’s conjuring for the sheer purpose of making yourself feel good. Patti Teel's Dream Academy is touring schools, hospitals, libraries, and bookstores throughout the country. At these fun, family events, Patti teaches parents and children the relaxation techniques from her new release, The Floppy Sleep Game Book. At the Dream Academy events, kids will be practicing the three R's by Resting their bodies, Relaxing their minds, and Refreshing their spirits. Click here to learn more about the Dream Academy. please email Patti at Patti@PattiTeel.com. Dream Starters are visualizations which promote relaxation, imagination and well-being as they guide children into the world of dreams. To prepare for these dream starters, (or visualizations), create a quiet comfortable atmosphere in which your child can relax. Have your child get very quiet and watch his own breath. Now that your child is relaxed, read (or tell) one of the following visualizations. Of course, feel free to modify it according to your child’s age and interests. It’s time to go to Dream Land. When you arrive, New Year’s dreams are filling Dream Land with sparkling dream dust. The tiny flecks dart through the sky and sprinkle your pajamas, hair and lashes with sparkling light. Tonight, the gigantic rainbow crystals of Dream Land look like snow covered mountains. They begin to hum and softly glow under the cover of dream dust, repeatedly blinking and turning red, orange, yellow, green, blue, violet and then silver. They are signaling you that it’s time for the Dream Academy to begin. The Dream Academy classroom has no ceiling so you can gaze at the beautiful moon and the bright, twinkling stars. The Dream Maker tells you and the other dreaming children that you each have a special star which first appeared in the sky when each of you were born. Look up at the sky and find your star. (Pause) It’s the one that’s winking and blinking at you. (Pause) Your little cloud begins to take you up into the sky towards your bright, sparkling star. As you float closer to your star, it twinkles with excitement. Finally, you are directly under your own star. The light from your special star shines down upon you, making you feel warm and tingly from the top of your head to the tips of your toes. (Pause) You are ready to sleep and dream. Your star showers you with its sparkling silvery dream dust, making all your dreams come true. As you sleep your star will watch over you, dancing and twinkling as you dream the night away. Sleep and dream now. Sleep; sleep sleep—and dream, dream, dream.